Jersey forward James Freeman says he is enjoying the start he has had to his career at the Championship club. The 24-year-old is the division's top try-scorer this season, having scored three times in two games. "They've been tough games but I'm really enjoying it so far," he told BBC Radio Jersey. "It's been good to come here straight off the bat and get into Championship rugby, especially with me coming from National One." 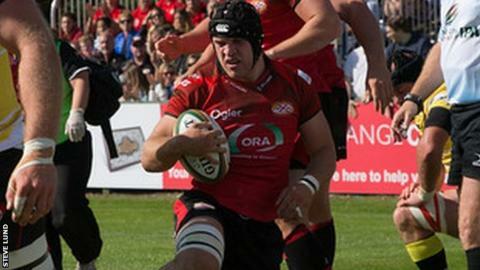 Freeman, who moved to Jersey in the summer from Loughborough Students, was one of 16 new signings that director of rugby Harvey Biljon brought in after the end of last season. "There's a lot of young lads this year and some of the older heads have helped that transition," he added. "We've done really well, it's a tight-knit group. We've got a smaller squad this year and for that it's just come together quite nicely. "You get to know how people play and how players are and you can work yourself off them." Jersey began the season with a 39-22 loss at Yorkshire Carnegie, but turned their form around to beat Cornish Pirates 17-15 at St Peter last week, where Freeman crossed the try-line twice. And the back-row says the team is gaining in confidence with each game they play. "I know what the team can achieve and where we can go, so I'm excited to see that," Freeman said. "We're starting to gel more and as we go through these games now and go further into the season we'll really start to see us rocking and rolling."